It will have no car parking spaces, it won't have air conditioning, and a caveat on the development means you can't sell your apartment for a profit beyond the suburb's average price increase. Reportedly almost 200 people want to buy one of these Fairfield apartments at Nightingale 2.0 located at 72a Station Street Fairfield in Melbourne's north-east - the latest project put forward by a group of architects wishing to actively and drastically change how Melbourne and possibly Australia's urban landscape develops. Nightingale 2.0 is an architect-funded development led by Six Degrees as Lead Architect and supported by HIP V. HYPE as Development Manager. The approval was only achieved yesterday through a "heated and divided" council chambers debate, according to The Age with five votes to four, with the decider cast by mayor Vince Fontana. The Nightingale Model database currently consists of over 800 interested buyers[/caption]The project presents a similar model to the 'original' Nightingale model by Breathe Architects with 20 apartments contained in a five-storey building – four one-bedroom, 12 two-bedroom and four three-bedroom. 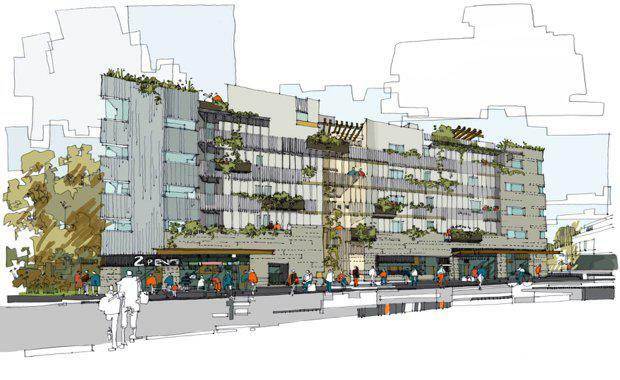 Nightingale 2.0 is adjacent to a railway station and will have no car parking. Instead, two to three bicycle parks will be provided for each apartment, totalling 46 spaces. The long-dormant former Fairfield railway land was bought last September for $1.9 million, according to The Age, with pre- existing approval for a five-level office structure. The Fairfield building will be without parking, air conditioning, second bathrooms, or spaces for private washing machines in apartments. A communal washing line, vegetable garden and bee hives will be housed on the roof. The development will feature a highly energy efficient 7.5 star minimum design, supported by double glazed timber windows and high levels of insulation throughout. Low impact materials including recycled timber floors and low or zero Volatile Organic Compounds (VOCs) in materials and finishes. Zero fossil fuels and 100% renewable energy during operation, supported by 15 kW rooftop solar system, high efficiency centralised systems and a bulk purchase of Green Power. Rainwater will be reused for toilet flushing and irrigation. According to reports, demand for the Fairfield apartments is tight with a ballot expected to be introduced. Prices have not yet been set, but its predecessor, the Nightingale in Brunswick, started at $400,000 for a one-bedroom apartment and up to $645,000 for two bedrooms with The Fairfield prices expected to be slightly higher. James Legge of Six Degrees Architects said to The Age the point of no marketing campaigns, display suites, car parking and other features is all about bringing the end price down and building a truly great place to live. James Legge of Six Degrees is lead architect and developer for Nightingale 2.0[/caption]Some councillors also raised concerns regarding the lack of car parking provision, an issue which has been the source of tension between the sustainable objectives of the Nightingale developments and local planning requirements. Demolition began last month in April. Negotiations continue between Austin Maynard Architects and a landowner on Sydney Road, Brunswick for the next Nightingale development site. Where did the 'Nightingale' model come from? The Commons building in Melbourne’s inner city Brunswick is now the sustainability Bible. With its rooftop gardens and bees, no air conditioning and no parking (but public transport passes instead), it attracted a huge amount of interest back in 2013. This includes from rival developers whose jaws - once picked up from the ground - were astonished at how a traditional developmental model can be flipped on its head - removing luxuries in the process - to attract buyers and tenants and continue to make a profit. The Commons took home the top accolade at the 2014 Sustainability Awards achieving the acclaimed 'Best of the Best' prize for its holistic approach to sustainability. The Nightingale Model partners[/caption]Second came The Nightingale, situated across the road from The Commons - developed by the same developers, Breathe Architects, this 20- unit project funded by architects which went a step further to deliberately keep profits as low as possible. Here, the Nightingale Model was born. The key aim here is to keep social, affordable housing on the table and indeed remind developers of the importance of social responsibility. Now, the rules have been bent even further with the Fairfield model passing council. www.nightingale.melbourne to get involved in the next Nightingale model development.